I’m in India for a couple weeks for business. On Sunday, I had two great religious experiences. The first, attending the small LDS branch near where I stay. There were about 20 in attendance. It was just very nice singing hymns together and hearing their talks and lessons and perspective. The second was visiting a Hindu temple that is devoted to the Goddess Mahalakshmi. I am probably going to butcher this about as bad as the average Mormon butchers Catholic doctrine on any given Sunday Gospel Doctrine lesson, but here goes. Lakshmi is one of Vishnu’s wives. Maha means “advanced form” and precedes Lakshmi implying her final, divine form. Vishnu is one of the main Gods in Hinduism. 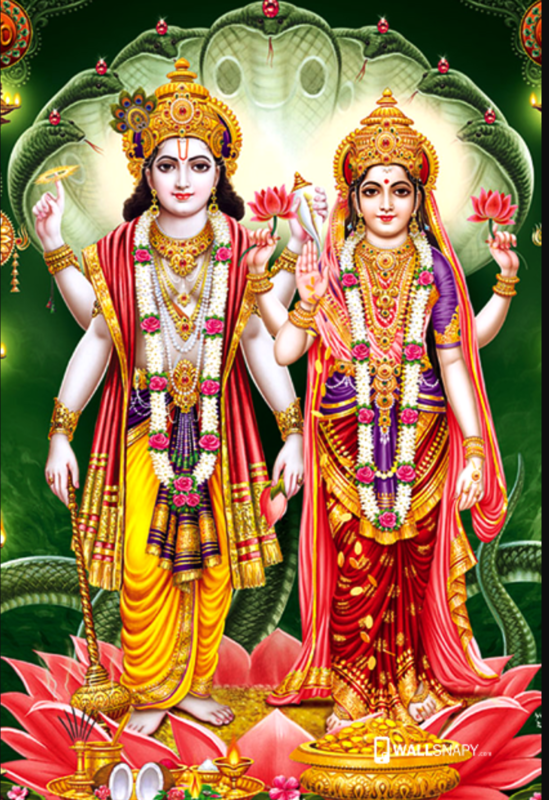 Vishnu and Lakshmi are seen together in Hindu art as worship symbols, sometimes as sort of a combined 2 in 1 God. In the center of the temple I visited, the main area of worship, were the two idols Vishnu and Mahalakshmi together. Hindu people would come and pray to them and worship. It was different than LDS temple and worship, obviously, but there was a reverence I appreciated and a moment I felt deeply touched by the Holy Ghost. As I walked up to the center to see the idol they were worshipping, I was hit so strongly by this image, as I imagined myself in the presence of Heavenly Father and Mother standing together looking down at me. I felt washed in the love of heavenly parents and all that an all powerful, loving, protective, and nurturing male and female combination can offer a child. There’s something about a Divine Mother that a male Deity can’t quite provide. And even moreso, there’s something about the combined unity of a Divine Father and Mother together that hits me in a deeper way. I think at the bottom of it, that’s what the Proclamation on the Family is driving at. Another cool part of the temple was a three panel description of the Divine Mother. With three pictures in three different roles. I wish I had pictures but no cameras allowed. A picture of a female God chopping off the heads of evil men “God’s destructive power in the form of Divine Mother.” I actually thought of Gina Colvin seeing this. In its barest essence, Hinduism believes in the existence of one infinite Supreme Power, or God, worshipped by Hindus in various representative forms, such as the Father or the Mother and Who is the Creator and progenitor of the Universe. The most fundamental tenet of our religion lays down that doing good to other beings is the highest form of Worship of the Lord, and conversely, harming the worse form of sin. Here is my own short summary of Hinduism as I have come to understand it coming to India several times over the past 10 years and reading and exploring and talking to Hindus. Hinduism is a religion that believes in One God. Hindus believe in stories that tell of incarnations of this God, representations of God on Earth. The purpose of these incarnations is to teach humans about the love of God and show by example the right way to live. And show humans their divine potential. These are ancient stories, with suspect historical details. These stories are recorded in what is considered scripture. These scriptures provide a set of symbols, sacraments, and language that Hindus can join together to use to worship God and practice living with each other the way they are taught. Some regard these as literally true. Some regard these as metaphorical but with true principles standing behind the symbols. They bind people to their ancestors and culture and each other and provide a framework to grow and progress. Hindus show love and reverence for God by treating other people with love and respect. Hindus testify that when they live the principles of their religion, they live with joy and peace. Turns out, this is a great way to describe Mormonism. On this trip, I’ve been also reading the book Zealot, about the historical Jesus. I don’t know what I believe about the historical figure Jesus. Either he is the Savior of the world and Son of God. Or the description of him in the New Testament is the perfect parable of the incarnation of God, Jesus Christ the Savior of the world. I don’t know the answer to that. I wrote about this in this post on the Condescension of God. But to me right now, it doesn’t feel any different, either way. I feel deeply committed to Jesus Christ and His teachings and head into this Christmas season very excited to have the chance to take more time to think on Him and His life, and how I can become a better disciple.